Sharing the beauty of African life today. Adventurer. Conservationist. Owner of Explorers World Travel. We finished four days and hundred of miles through the Serengeti, found the migration in multiple places and ended for our last two nights at Tanzania’s famous Crater Lodge. It’s unusually dry. Not yet a crisis it will become so if widespread rain doesn’t develop, soon. We arrived the crater in a rainstorm, so that was obviously good news. But the day that preceded our arrival was a dust bowl. As I listen to the news back home and hear of the flooding near my home in Galena, Illinois, the fact of “unusual” weather seems nothing but normal. But the point is that northern Illinois is much better equipped to handle extreme weather than northern Tanzania. There aren’t “emergency declarations” with quick funds to immediately start rescue and rebuilding for the communities and farms effected. Just getting the facts as to the weather events is hard enough. There are few weather stations and fewer meteorologists to interpret the data. The animals handle extreme weather pretty well. The wildebeest migration is all over the place, because the edible grass is. We saw bits of the migration in the Maasai kopjes (1-2,000), larger bits in the Moru kopjes (5-6,000), a very large number in and around Kusini (20-25,000) and the largest concentration where all of them should have been, on the plains south of Ndutu (40-45,000). That’s still a small representation of what I normally find (a quarter million) so undoubtedly they are scattered in lots of other places, too. Young that were hardly a week old had run with their mothers for several days and possibly 100 kilometers to some of the fresh grasses found there. Every baby that we saw looked exhausted if not actually sick. And to make matters worse, the grasses this far north in the Serengeti are not as nutritious as those that will grow in the south if the rain comes. Nevertheless, the herds were in relatively good shape overall, precisely because they fractured and dispersed. There just isn’t enough grass for everyone right now on the great southern plains, so partial herds are following the irregular thunderstorms that are firing off now in many different places that in a normal year would be bone dry. All the other animals still look great! We saw amazingly large, healthy herds of eland, the world’s largest antelope which is also the shyest. Males up to 2,000 pounds lead packs that we saw of almost 50 individuals in massive runs away from us, often leaping into the air! Thomson’s gazelle were birthing in the Lemuta Plains where we went today, and the numbers were large and looked healthy. Zebra remain feisty and playful. And we’ve seen an extraordinary number of cats: lost count of the lions, but we saw 4 leopard, 2 serval, 2 wild cats and witnessed a cheetah hunt of a baby wildebeest. So for now the plains are OK, despite extreme weather which is teasing a drought. 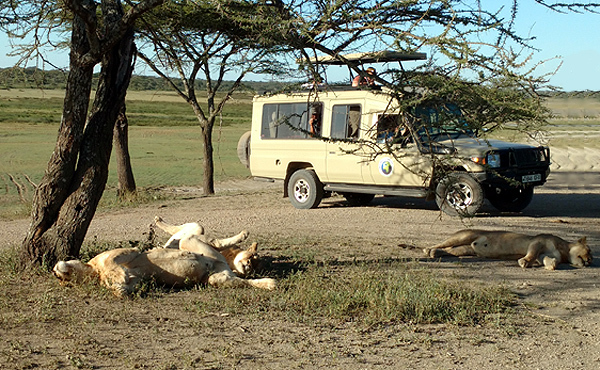 Tomorrow we end the safari with our game drive in the crater. Stay tuned!